One of the new features being added to the website is going to be an extra blog tab that is devoted to your stories that you want to be sent in. If Squarespace has the option it will be a blog that you can submit your stories on, with an option for it to remain anonymous if you choose. A lot of people that contact me on Haunted Nova Scotia are worried about the stigma surrounding people believing in spirits. If Squarespace doesn’t have the option for this, there will be the option for you to send me your stories through the ‘contact us’ tab, and I add the stories as they come in. If someone chooses to remain anonymous I will make sure that their names aren’t added to the submission. However I would love to include the locations on each post, since I tend to collect stories voraciously. The idea for reader submitted stories is mainly from my love for reading stories on submitted sites like The Shadowlands, as well as a lot of my co-workers having interesting creepy stories of their own from working different job sites. We often work alone, at remote lone worker locations. Sometimes we get posted to places where odd things happen, odd things that everyone who works there start to notice. It’s never really shared in pass on notes, but passed on in conversation between us. I hope everyone is doing well! We have more investigations and events coming up for you to enjoy! Our investigation group started when I noticed just how many people were joining our Facebook page Haunted Nova Scotia every day. For the most part the page is also how we attract new investigators and new investigations. it’s a great way to keep in touch with the community and organize events. November 18-19 is our first contest giveaway, with five members winning a Haunted Nova Scotia article of clothing. We are going to be holding similar contests from here on out, as well as contests for guest spots at our events, and contests for paranormal gear! As we roll into 2019 and begin filming, I hope to have our online store on this page live as well, and to be selling gear, merch, and smudging supplies. Make sure you join Haunted Nova Scotia and stay tuned for new contests and events! Hey everyone, I know it's been a little bit since we have updated the site, and I just wanted to fill everyone in on what's been going on with the group! Throughout the winter months we generally don't venture very far from Truro, as the weather can deteriorate and the road conditions can be horrible. I don't like having investigators out on the road in bad weather, so the colder months of the year have always been our down time. That being said however we have been working our way through some of the residential requests that have come our way lately. In the last month we have investigated a home in North River, another one in downtown Truro, and an apartment in Dartmouth. I will have the evidence from these posted on the website in the next week or two. The investigation in North River is one that we will conduct again with more equipment, as the home owners have noticed the activity increasing, and they also enjoy spirituality and paranormal work and want to help out with the investigation. The person living at the Dartmouth location has also informed us that we are welcome to return to investigate again whenever we would like. Along with our residential and private investigations I am hoping to host an event at the Truro Museum in April... this is a location that we have investigated and held public events at for over four years, and is always a popular one that guests look forward to. The staff at the museum are always happy to have us in, so it's just a matter of P.I.N.S. finding a common date that works for our various schedules. Drop us a line through the website or our FB group Haunted Nova Scotia if you have any questions! Once again this summer Paranormal Investigations Nova Scotia had the privilege of investigating the fortress as well as hosting two events on the weekend of August 12 and 13. During the evening of August 11 we investigated privately, accompanied by several Parks Canada summer staff members whom we had met in 2016. This year the activity was quite overwhelming... we think that it might have been a combination of the meteor showers that were happening that weekend, the 40% increase in tourism and visitors due to the Canada 150 entrance fees waived, and the mass burial being unearched by archaeologists at Rocheford Point, about half a kilometer from the buildings that make up the fortress. On Saturday night we played host to 35 guests. who enjoyed tours of the fortress and tales of when it was an active fortified community, a period style meal and rum tasting, and a ghost tour followed by investigating with us in groups. The weather was sullen and gloomy, with periodic rain showers coming down until it began to pour in earnest around 1:00 A.M.
Once it began seriously pouring, most of the guests decided to turn in for the night, and our members returned to the cabins that we were staying at for the weekend. Several members drove back to Truro and Pugwash that night, work schedules requiring them to only stay for one night in Louisbourg. The event on Sunday night was a half evening event, in which the guests went on a tour of Louisbourg and then had the opportunity to investigate some of the hot spots of Louisbourg with our team. Afterwards, our group ended the weekend by having a drink together back at the cabins and packing up to leave the following morning. As always we had a wonderful time in Louisbourg, it is an incredibly special place that we always look forward to visiting. This year we also trained our new investigator Tracy, who joined the P.I.N.S. team after the Louisbourg events in 2016. We also gained a new member, Laura, who has attended many of our events and is an experienced investigator. Shortly all of our evidence will be compiled and put on the website as well as our social media sources such as the Facebook group Haunted Nova Scotia and our YouTube channel. Thank you to all of our guests, everyone that followed our Facebook Live feeds, and especially the students and staff at the fortress and with the Fortress Association. See you soon! As my journalism internship comes to a close and I look forward to what the summer is going to bring for the group, I am reminded of how many people have sent us messages over the past year wondering how they can join the group and what is required to join Paranormal Investigations Nova Scotia. For the most part we are all based in Truro, which is great for when we need to plan meetings, be it large group meetings where a lot of information is passed on, or short meetings between a few people before an investigation. This isn't a requirement, we do have a member in Amherst, a member in Stellarton and a member in Bedford. All of them accepted that they would have to drive a bit further than the other members in some cases. New members must have a car and a valid drivers license. We carpool to most locations, which means sharing driving responsibilities and vehicles, as well as traveling alone occasionally, especially if you live outside of the 'hub' of the province. New members must have a reliable source of income. In the past we have charged monthly dues to help offset the cost of insurance and other bills. That has been waived for the time being, however we travel often and occasionally book lodgings when we are doing events such as the events at the fortress of Louisbourg. One thing that all of us at P.I.N.S. agree on is we are looking for people who are interested in joining a team long term. We don't always get evidence when we investigate, and a lot of people become disenchanted with the hobby and field of study when they realize that it's not always exciting. Starting next week I will be going through requests to meet for an interview. Send us a message if you're interested and live within 100 kilometers from Truro! This has been a whirlwind of a winter, all of our members have been busy with school, work, and other day to day commitments. We tend to slow down to almost a complete halt each winter, to keep our investigators off of dangerous roads and to also take a deep breath and reflect on the investigations and events that keep us busy the remainder of the year. We have several different dates that we are debating for our annual weekend at Louisbourg this summer, and we are also booking residential investigations. I have had a lot of questions recently about the cost per house visit. If we are traveling outside of the Truro area, we charge 0.25c per kilometer, for one vehicle only. It's a small cost to cover our fuel when we are on the road. We are going to be filming all of our investigations for our YouTube channel, especially now that I have more ability to use high end editing programs. Along with the normal video footage that we have shared on here and on Haunted Nova Scotia, GoPro footage as well as drone footagewill be included. I would also really like to get more interviews from home and business owners while we are on site. We're looking forward to seeing everyone at our events this year, as well as meeting new families during our residential visits. Never hesitate to contact us on here if you have any questions or comments! Hey everyone, I know that we have been silent for the last couple of months, and I apologize. All of our events at the fortress of Louisbourg went extremely well this summer. Our first event was an all night ghost hunt at the fortress, which included a period meal and rum tasting as well as camping accommodations for the night. Guests were also allowed to sleep in the buildings on site. This event began at 5:00 PM, and by 2:00 am most of our guests as well as my team members were bedding down for the night. Darcy, Amanda and myself remained up for the rest of the evening, checking on guests and occasionally taking small groups on private investigations. Several guests reported seeing Darcy and I walking slowly through the barracks around 2:00 am. One of the guests that mentioned this to us after the weekend was over is now also an investigator in the group. She and her son were positive that they saw us in the building. The odd thing is at the time she saw us walking through the building we were at the far end of the fortress in another building entirely. During events all of my members wear our event staff shirts, which are a vivid orange color. After we received the first account of seeing what they thought to be Darcy and I in one building, another group came forward to comment that they saw what they thought was Darcy in De Le Plagne house. This house is mainly used for offices, and during events is locked to guests and our team. Nobody was in that building at the time. The following night we hosted a smaller tour for twenty people that lasted five hours. During this time we were able to show the guests all of the areas that we have recorded evidence, and allow them to use our equipment to investigate the fortress. During both evenings guests and our team recorded evidence that we consider unexplainable or paranormal in nature. We received glowing praise from all of the guests that attended, and we are most certainly going to be back to host overnight events in 2017. 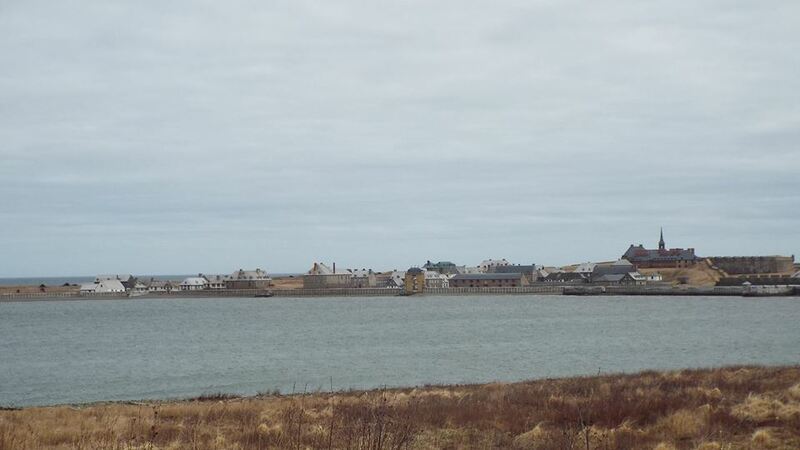 Louisbourg is a very special place, and it is a location that I always feel homesick for. Leaving the fortress and the village is always a bittersweet moment for our team. We are always happy to be on the way home again after busy weekends, but it is also sad to say goodbye to the staff and actors that work at the fortress. Thank you to all of the guests and staff that made this event such a success. We will be making plans for the next events within a month when we all have our schedules for next summer. Keep an eye on this page as well as Haunted Nova Scotia for event news! Ouija boards have been around for well over a century, and are definitely one of the more controversial tools of spirituality and the paranormal. I love them and collect as many of them as I can, especially when I come across a new board design or style of board. Antique boards are always exciting to come across, as are Ouija tables and other furniture. If you go to any search engine and type in "Ouija stories" you are going to find hundreds, if not thousands of stories about people who have used the board only to have horrendous and often hellish results. I remember years ago coming across a story stemming from Ontario in which a family used the board after they had dinner, only to have a demonic being erupt into the room, pummel them around the house for several minutes, and then disappear as quickly as it appeared. I find it very hard to take stories like that seriously as an investigator. For all of the stories that are dubious, there are just as many reports from people who have hosted séances and sessions and had absolutely nothing happen. A lot of the time completely gibberish is spelled out, or the people in the session discover that one person was slyly moving the planchette around to frighten the other users. One huge problem with taking the answers that the board spells out seriously is called the Ideomotor Effect. In the case of using a Ouija board, the Ideomotor Effect is a phenomena where the sub-conscious mind decides to move the planchette without the user being aware that they are choosing what the board is spelling out. Scientists and skeptics will usually call attention to this phenomena when a session seems to be spelling out answers that nobody in the room could possibly know. When we conduct our P.I.N.S. session, the people using the board will be led into the room blind folded. They will not know where their position is around the board, or even what board out of my collection that they are using. Towards the end of this blog I will post a short video that explains every aspect of our sessions as well as the investigative equipment that we will be using. There have been movies and television shows produced solely on the ZOZO encounters that are reported to the media. Below is a video clip that Darren Evans uploaded to YouTube several years ago. His video is being shared here with his permission. While ZOZO is the most common names that comes up when people are using the board, it is definitely not the only one. These names cropping up all over the world are similar to the sightings of certain shadow people that are being seen and documented from every corner of the world. Hatman is a perfect example, in fact we will be investigating a shadow person/Hatman sighting later this month when we return from our three day event at the fortress of Louisbourg in Cape Breton. Below is a short video of what we will be doing with the Ouija video in terms of the séance as well as the editing and the equipment that we will be using. As I state in the video I'm not sure whose house we will be shooting this at, as I have two large dogs that like to get in the way. They are also camera hogs, so they would be more interested in jumping around than behaving and staying out of the way. Enjoy! The following story was originally sent to me a few weeks ago, in the middle of the night by a friend that was quite freaked out. Around 2:00 am this morning I was woken to the sound of my cell phone chiming that I had a FB message. I had a look at the message and it was a friend, asking me if I was in Truro and available to meet her. She was very upset, and it took me a few minutes to wake up and start to piece together what had happened to her. She has always been interested in the paranormal and the spooky side of things, it takes a lot to rattle her. She was hanging out in a park with a couple of fr...iends, a park that they had been to before several times in the past. On this particular night they had been there for awhile, chatting and enjoying the quiet of the park when they all suddenly felt like something was watching them. She described this feeling as being one of menace and evil, not the normal (but still creepy) feeling they would get if another person was watching them. They looked in the direction that this feeling was coming from, and saw a shadow person standing there, watching them from the trees. Whatever this was, they knew instantly that it did NOT want them there, that for whatever reason they were encroaching on it. My friend described it as a feeling of being frightened of it, but an even stronger feeling that something bad was going to happen. Although it was definately a shadow person, she noted that she could see the outline of a large hat, the torso appeared cloaked, fading around the lower legs. She could see eyes under the brim of the hat, what she described as cold dead eyes. The friend who messaged me told me that when she was taking all of this in and as they were backing out of the area back to their car, she noticed that her eyes had been streaming tears, which she couldn't explain. The entire drive home she was freezing and had the heater blasting. She felt like it was following them, which is why she was so upset when she messaged me. By the time she had told me what happened, she was feeling more like she was in her home alone again rather than the sensation that whatever they had seen had followed her. We have been talking most of the day today, and she is feeling drained and in her words 'a mess.' The two friends who were with her felt odd for a few hours and then slowly felt back to normal. I went out to the park that they had been at today, and finally found the area that they had been sitting and talking. It felt very odd and heavy, but I attribute that to the story she told me. I am planning to investigate this area very shortly with her. She feels like she has seen it before, but she can't remember where, when, or the age she was when she saw it. For comparision with other Hatman and other shadow figures that have been reported, I asked her if she had time to sketch a rough figure of what she saw. Attached below is the drawing she sent me. Early in July our investigation team as well as the person who had this encounter are going to be investigating the park with all of our equipment. As always, we will post any and all evidence on here as well as our Facebook page Haunted Nova Scotia! The sighting of shadow people is one of the paranormal encounters that are most often reported to investigation teams, and I have met dozens if not hundreds of people who have stories to tell of shadow people since starting Haunted Nova Scotia in 2007. There are documented cases of people seeing shadow people that date back not decades, but centuries. One of the earliest descriptions of the encounter was that the entity was 'blacker than the blackest night.' That tells me that the tent or hut that the person was sleeping in would have been pitch black, yet whatever was in the room with them was even darker. Years ago a friend and I were investigating a cemetery that we knew to be haunted. This was long before I had collected equipment, in fact if memory serves I think the only thing we had with us was a digital camera. Throughout our 'investigation' we did capture few odd anomalies and glitches on our camera, but the main thing that we both noticed was a growing feeling be being watched and being somewhere that we shouldn't be. It felt like someone was watching us from a few yards away and didn't want us there. The decision to leave and go home was unanimous, and we left the cemetery and started walking home. Just as we left the cemetery and met the street my friend grabbed my arm and pointed back into the cemetery. I looked to where he was pointing, and saw what looked like a man sized shadow dart into the treeline at the back corner of the cemetery. It re-emerged a few seconds later, moving in the opposite direction before vanishing in the tree line again. Freaked out, we definitely didn't waste any time getting home that night! Television shows and Hollywood always portray shadow people as negative or demonic entities. I'm not sure if I believe that or not, but over the years of being the sole group administrator for Haunted Nova Scotia I have heard plenty of stories from people who have seen or encountered these shadowy figures, and one common factor is they always feel the entity is threatening or malicious. Months before meeting me and joining our team Heather Rann and a friend were out exploring known haunted locations when they captured the following two photographs at a location off of Lower Truro Road. They had been at this location for some time when her friend began to feel uneasy, like something didn't want them there. The next photo that she took was of the large tree in the center of the clearing. In the photo below you can see a dark human shaped figure standing in front of the tree. While they didn't see anything in the viewfinder of the camera after taking the photo, both women began feeling like something definitely did not want them there and that it was time for them to leave. Before reaching the driveway leading to this site Heathers friend turned and took one final photo. In this photo the figure is closer to them, as if it were chasing them. You can see some of the foliage through the figure as well, which is quite interesting. Both of these photos created quite a bit of discussion on Haunted Nova Scotia, obviously. Our team returned to this site several times, and on one occasion we received a very odd video. The investigator was shining a flashlight directly at the tree and recording it with her cell phone when in the video feed you can see a quick flash of two faces on the tree. It could be pareidolia, a trick of the eye due to shifting patterns but it is a neat video to watch. If I can, I will embed it on this page for viewers to watch. What I find fascinating and unnerving about shadow people is the fact that there are several different entities that people identify from their characteristic features. A well known one is 'Hat Man', a shadowy figure that is wearing a large brimmed hat. All of the people who have encountered this entity report that it feels extremely negative, as well as mocking. Several members of Haunted Nova Scotia have sent me private messages that they have encountered this entity, and that it was always standing some distance away, observing them. Other people have reporteda smaller entity accompanying Hat Man. Because all of these entities appear black and shadowy, I think that they are just outside the spectrum of light that we view the world in. If we see glimpse something that is outside the realm of visible light for humans it wouldn't have color, it would just appear black to us. The fact that every single person reports a menacing frightening vibe from them tends to make me lean more towards the belief that they are negative. Feel free to comment if you've had your own experiences with shadow people! Infrared camcorder with three infrared floodlights attached - the floodlights cover a distance of about 50 feet. Full spectrum camcorder with two Creepy Hollow full spectrum floodlights attached. The floodlights cover a distance of about 50 feet. When we are investigating, we use several different kinds of camcorders and cameras but the two most common are the infrared camcorder and the full spectrum camcorder. The infrared camcorder has the ability to record our investigations in 0 light conditions. Because the camcorder is using the infrared floodlights to illuminate the area the footage shot with this camcorder has a light purple color. A lot of the time when our team is investigating I will leave this camera running on a tripod so that it can record everything that we are doing. There have been many times that it has captured movement or anomalies that we had no idea were happening at the time. That's what can make the long hours of reviewing data exciting, when you come across events that were played out around you without you being aware of them. We have also captured class A EVP clips on this camcorder when nobody was anywhere near the camera. The other great aspect of the infrared camcorder is the fact that to the naked eye, the floodlights emit next to no light. When we have been investigating in the dark for awhile there is nothing worse than being blinded by a bright camera light and ruining your night vision. The full spectrum camcorder has the ability to record video in the ultraviolet spectrum of light, the spectrum of light that is visible to us, and the infrared spectrum of light. Footage from these camcorders are also slightly purple in tone, but like the infrared camera they still record high quality video. The only downside to this camcorder is that the floodlights are incredibly bright, and you can very easily blind enough investigator for a few seconds if you're not careful. If you place this camera in a position to pan a room and have it angled so that the chance of someone momentarily being blinded is less they are great to have on an investigation. The great thing about full spectrum gear is that it allows us to utilize all three of the light spectrums at once. Babies and young toddlers are born with the ability to see a tiny fraction of the ultraviolet realm of light. In most cases this fades very quickly, much as our vision fades over time as we age. This could explain why babies will sometimes focus on something that we can't see, and it also could explain why people often comment that they are constantly seeing something in their peripheral vision, but when they turn to face it they don't see anything. The brief ability to see into the UV realm of light is in a child's peripheral. With this camcorder, we can record something that our naked eye wouldn't register. Both of these camcorders can be purchased for about $350 Canadian funds, but they do not come with a bracket for the lights or the floodlights. I believe both of the camera set ups pictured above ended up costing me about $500, perhaps a little bit more. If you are going to purchase camera gear, Creepy Hollow is a very good company to purchase your infrared and full spectrum floodlights from. If you've ever watched a ghost show or read about investigations, one of the more common terms you will probably have come across is electronic voice phenomena, better known as EVP. EVP is the attempt to record and analyze spirit voices. Investigators and hobbyists have been using this method since roughly 1941, although EVP didn't get much attention or credence until 1956 when reel to reel recorders became widely available. People began to pay more attention to EVP methods again in 1959 when the American Society for Psychical Research began publishing articles on EVP methods and recordings. While we use a wide array of audio techniques during our investigations, I always tend to spend half of our audio work on site by using just a digital recorder with no enhancements. During an investigation last year I was walking through a cemetery by myself, recording an EVP session. At one point I asked 'what year did you die' and recorded a very faint voice responding with 1860 or 1960. The audio file is posted below, and I recommend headphones while listening to it as it is very faint. The other method of recording spirit voices is known as instrumental trans communication, or ITC. This is a method of using a recorder as well as an electronic device to communicate with spirits. The method has been around since 1910, and the devices and techniques involved have improved as more modern technology was available. Friedrich Juergenson, Thomas Edison, Dr. Konstantin Raudive, Klaus Scheiber and Frank Sumption are all famous individuals and inventors who have pushed the field of ITC forward with modern devices and new techniques. We use ITC techniques for the other half of our audio sessions after we have conducted EVP sessions. The devices that we use are the SP7 spirit box and the SB11 spirit box. The boxes can scan radio frequencies at very high rates of speed in FM/AM and forward/reverse. I tend to scan FM in reverse at a scan speed of 100 milliseconds. The belief with these devices is that spirits can use the radio frequencies as well as the white noise between the frequencies to communicate with us. Because these devices use radio frequency the responses we get have to be very valid for us to consider them evidence. A faraday pouch to shield most of the radio frequency is also used on some investigations. In 2014 our team was investigating the fortress of Louisbourg when Amanda recorded a relevant response using ITC in the chapel of the Kings Bastion. In the clip you hear her asking if the spirits were soldiers and how they died. On recording she received the answer 'we all were shot.' This clip is very muffled due to editing filters and is listed below. If people were interested in buying EVP or ITC devices I would recommend an Olympus recorder which are very good quality devices and generally don't cost very much (I think the one pictured above was $100.) An SB7 device is about $60 and is a very good box for beginners. Audacity is the free software that weedit all of our audio data with. In the next few posts I will also be embedding videos and going into detail on the cameras and video cameras that we use, and why! Nova Scotia is a province rich with folklore and known world wide for our gifted storytellers. Because of this we often get a chance to work with other talented groups and individuals. Sometimes they're other paranormal groups, while other times they are journalists, historians, or members of Parks Canada. In the past we have had the good fortune to work with Lynn Curwin from the Truro Daily News, Jackie Torrens who is a maritime documentarian, CTV, Kings College radio, members of Parks Canada, and most recently Jordan Bonaparte who owns and operates a Halifax based podcast by the name of The Night Time Podcast. Heather and I were interviewed over the phone by him recently, and then joined him in his studio to share some of our audio evidence as well as a few clips of our video evidence. http://www.nighttimepodcast.com/ is the address for his podcast, and our chat with him is featured on episode 16. We had a blast working with him, and he will be joining us when our team investigates the Halifax Citadel later this month. We are looking forward to working with him again, and thanks again for having us in to your studio Jordan! Having any business or person representing a business can be a stressful experience at the best of times. Members of Paranormal Investigations Nova Scotia do their best to make the experience an enjoyable one. We love meeting new people, and we want our clients to feel comfortable. For the time being our residential investigations are cost free. So what should you expect when you book an investigation with our team? When we arrive we take time to sit down with you and let you tell us what has been happening in your house. An audio recorder or a video recorder will be used during this part of the investigation so that we will be able to use it as a reference when we are going over our evidence. After we have had a chance to talk with each member of the family we will begin doing what is known as a baseline recording of the house. We record the ambient temperature of each floor of the house, as well as the level of the electromagnetic fields in each room. Old or faulty wiring can cause electricity to leak into the atmosphere, and high levels of this can cause a lot of thesymptoms people experience when they suspect their house is haunted. By having a baseline reading of EMF levels and ambient temperature we will be able to record any sudden variations or changes. After our baseline readings are recorded we will begin the formal investigation. We set up a variety of camcorders in different rooms of the house, as well as our DVR system if the area is large and requires a lot of coverage. It is at this stage of the investigation that we usually split into smaller groups to cover different areas of the house. Our team relies heavily on the use of digital audio recorders and other audio devices to capture evidence. When we conclude the investigation we like to sit down with the client to explain everything that we have done, and also give them an estimate on when we will have our data reviewed and ready to present to them. After we have presented our findings, we ask permission to share our findings on our Facebook page Haunted Nova Scotia and this webpage. This decision is completely up to the client and we respect whichever decision they make. We look forward to meeting you, if you feel like you would like to have us in for an investigation! After a lot of delays, we are close to finishing our website and launching it to the public. I am hoping to have the blog be a section where all of the members of Paranormal Investigations Nova Scotia can add entries. While we all investigate together, we also have varied interests in metaphysics and spirituality in general so it would be great to have blog entries from all of our members. If you've been a member of our Facebook page Haunted Nova Scotia for awhile, you will have seen and read the reports that we submit to our clients after every investigation. The Investigations page of this webpage will be centered on all of our evidence that we capture when we are out investigating, as well as the written report. I will also work on having links to our sound files so that everyone can listen to our EVP evidence, and will provide links to our videos. the Merchandise section of the site will be an area where people can purchase our team garments as well as Haunted Nova Scotia garments and smudging materials. The merchandise section might remain empty for the time being until we have stock in. Our merchandise will also be sold at our public events. The Events section of the site will be a simple calendarof when we are investigating or hosting events, and where these events are going to be held. We do our best to provide as many events as possible for the public to attend, and we already have plans for new locations in 2016 and 2017. Our contact information is the last section of the site. Along with that information we can always be contacted directly on our Facebook page Haunted Nova Scotia.